Here are some old school gloves made from grade A deerskin leather. 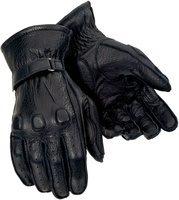 Can’t get much more retro looking than these – for some reason I just picture someone riding a 1932 Indian Scout when I see these… but they should work for other model years too :-) In fact, these gloves are very very comfortable right out of the packaging. Deerskin is extremely soft and supple, and the external stitching on these gloves means there isn’t anything digging into your hands or fingers. There are some perforations in the fingers, and some padded knuckle protection as well. A Velcro wrist strap secures the gloves at the base of the hand. These gloves should break in very nicely and last a good while as well. Be sure to check out our photos of these gloves by clicking the “View Larger Images” link above.